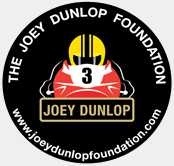 Changes at Joey Dunlop Foundation. Following the completion of the new works at Braddan Bridge House there have now been some changes in command at The Foundation. Out have gone firstly, Kevin Quirk one of the original trustees of the Foundation and who had latterly been managing the complex for a number of years ever since it opened. Kevin has been around for a long time and achieved many things in his time for the good of the Foundation. Also, long standing committee member Bob Stimpson, has signalled his intention to stand down at the end of September to concentrate on his many other activities - too many to mention here . Bob has aided the trustees greatly over a lot of years with his specialist input on technical aspects of the Foundation and the original building; then more recently had been heavily involved in the planning and new building and the level access requirements and installations to equip the house. We will not be losing touch with him completely as happily he has agreed to assist the Foundation in the future with one off special projects that involve the Foundation. The Foundation is delighted that his association with the Foundation will continue and that his services will still be available to them. Aside from departures, as importantly, there have also been some internal changes too. John Watterson, who has fulfilled the responsibilities of chairman for 8 years is stepping down but will continue as a trustee and deal with the legal and reporting responsibilities of the Foundation and the management of the Foundation’s property owning company as well as the licence for what has become a major event, the annual motorcycle tombola. Stepping into his place will be Bruce Baker who has been a trustee of the Foundation for many years and will now oversee the Foundation’s future. His background and contribution to the Foundation have been valuable for many years and will naturally continue in his new role as chairman. It is very much a changing of the guard with changes but also very reassuring to know that it happily continues in good hands hopefully now going from strength to strength in its objects. Bruce Baker and John Watterson between them have over 25 years combined service to the Foundation as trustees but as always, will be heavily supported by a small but dedicated committee of very loyal volunteers. Gilly Keown, who has already taken on most of Kevin’s responsibilities together with Barry Steels and Charlie Bond who both do a substantial amount of fund raising for the Foundation while Charlie also seems to spend a lot of time looking after the plumbing at the House. John Watterson and new chairman Bruce Baker paid tribute to Kevin and Bob for their contribution over many years and look forward to the continued success of the Foundation.